You’re going through the grocery store and casually walk through the produce section…for the third time. You always make sure to pass the apples and linger a bit. You can’t remember the last time you were actually able to eat one. Your missing teeth have made it difficult to chew a lot of things, and it was a sad day when it became too much of a task to eat an apple. On this particular day, you decide it’s finally time to do something about it. The only question is, what should you use to replace your missing teeth in San Antonio? There are a few options out there, but which one is best for you? The doctors at New Image Dentistry are going to tell you a little more about crowns, bridges, dentures, and dental implants. Crowns and bridges have been used for decades to fix broken and missing teeth. Crowns are typically used to restore a single damaged tooth. The restoration (made of metal or porcelain) simply slips over the tooth that needs repair to reinforce its structure and improve its appearance. These crowns can then be used to support a row of prosthetic teeth, creating a dental bridge. These prosthetic teeth simply sit on top of the gums and look completely natural. They are one of the quickest and easiest ways to fill in the gaps in your smile. For patients who are missing many of their teeth, a set of partial or full dentures could be their solution. We use a series of scans, photos, and x-rays of your mouth and jaw to ensure that your dentures have the best possible look and feel. 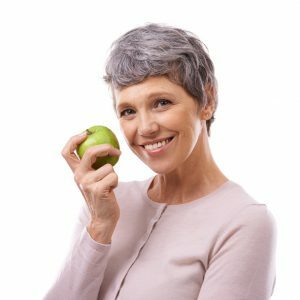 Dentures have been shown to dramatically increase a patient’s ability to enjoy a wider variety of foods, improving their overall health and quality of life. They are typically held in place with natural suction, denture adhesive, or even dental implants. While all of the methods offered by New Image Dentistry are more than capable of restoring your missing teeth, dental implants are by far the most comprehensive and reliable over time. The only way to figure out which method is best for you is to make an appointment with your dentist in San Antonio today. We will make sure that you understand all of your options so you can feel confident in your decision. Stop thinking about food and start taking the steps to enjoy it again.